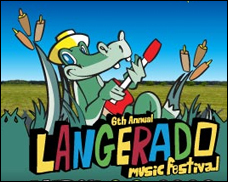 BIG CYPRESS FL (CelebrityAccess MediaWire) — Today, the sixth annual Langerado Music Festival announces its initial artist lineup. The 2008 event takes place March 6–9, and will host R.E.M., Beastie Boys, Phil Lesh & Friends, 311, Matisyahu, Ani DiFranco, Ben Folds, The Roots, Thievery Corporation, Les Claypool, G. Love & Special Sauce, Built to Spill, The Disco Biscuits, Umphrey’s McGee, Ghostland Observatory, The National, !! !, Minus the Bear, State Radio, Citizen Cope, Medeski, Scofield, Martin & Wood, The Wailers, Of Montreal, Robert Randolph & the Family Band and many others. For the complete confirmed lineup, please visit www.langerado.com. Many others still to be announced. After five years of strong growth and consistently eclectic musical lineups, Langerado organizers have moved the event to the expansive Big Cypress Seminole Indian Reservation for this sixth year. Big Cypress will offer Langerado 2008 attendees a much larger, yet still intimate, festival site that exemplifies true native Florida. Attendees can anticipate all-inclusive on-site camping, plenty of late night music, and an expanded VIP ticketholder experience. The transition from day festival to a camping event is a welcome change and marks Langerado’s exceptional growth over the past five years. The festival boasts multiple stages, food and crafts vendors including an extensive selection of beer, an expanded kid’s area, and a full camping experience. Additionally, attendees have the option to purchase all-inclusive ticket packages to the festival, featuring a hotel accommodations and transportation to and from the festival – whether by shuttle directly from the airport, shuttle from an official hotel, or even in a chartered helicopter!